California Fires Spread Rapidly, Killing 7th Person There are 18 fires blazing in California, and officials say this year the wildfires have spread faster and burned more land earlier in the fire season than usual. A car passes through flames on Highway 299 as the Carr Fire burns through Shasta, Calif., on July 26. Fueled by high temperatures, wind and low humidity, the blaze has destroyed multiple structures and killed seven people. A seventh person died in a fire in northern California on Saturday. The Carr fire, burning about 162 miles north of Sacramento, killed a power company lineman, according to a CBS affiliate. That fire had already killed six people, including a great-grandmother and two children. 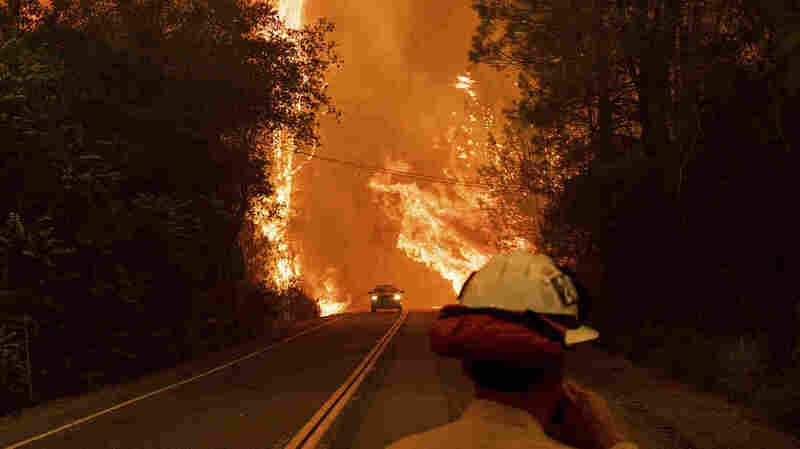 More than 4,500 firefighters have been battling the blaze for nearly two weeks, facing triple-digit temperatures and winds up to 30 mph, according to The Los Angeles Times. The cause of the fire remains under investigation; The Los Angeles Times also reports that some "have blamed the start of the massive blaze on a vehicle towing a trailer with a flat tire, its metal rim creating sparks as it rolled along." Two other fires called the Mendocino Complex are burning about 90 miles north of San Francisco. By late Saturday those fires covered 229,000 acres --more than two-thirds the size of the city of Los Angeles, and were considered 32 percent contained, according to Reuters. Those fires have forced the evacuation of 20,000 residents, and destroyed more than 100 structures. The Mendocino Complex fires are now some of the largest on record in California's history. President Trump has declared that a major disaster exists in California, paving the way for federal money and aid. "Assistance can include grants for temporary housing and home repairs, low-cost loans to cover uninsured property loses and other programs to help individuals and business owners recover from the effects of the disaster," the White House said. The National Weather Service has issued a red flag warning in parts of California for conditions that are conducive to the growth of wildfires including strong winds, low humidity and very high temperatures. Cal Fire director Ken Pimlott says the California wildfires have grown faster, and burned more land, earlier in the fire season than usual. He told Reuters, "Fire season is really just beginning. What seems like we should be in the peak of fire season, historically, is really now the kind of conditions we're seeing really at the beginning." According to Cal Fire, California fires have burned about 290,000 acres so far this year, more than double the five-year average over the same time period. According to Reuters and the National Interagency Fire Center, U.S. fires have burned 5 million acres, far more than the 10-year average. There are now 18 wildfires blazing across California. KQED's Lesley McClurg and Kat Snow reported for NPR that the fires have had lasting impacts on residents there, "Confronting constant reminders of what fire can do has become a terrifying reality for people who survived last year's flames and are still piecing their lives back together." After visiting some of the fire-ravaged areas on Saturday, California Gov. Jerry Brown told Reuters, "This is part of a trend, the new normal, that we've got to deal with."